Chili Cornbread Crisps Pie - the delicious "all-in-one- dish! Spicy Chili Cornbread Crisps Pie is the delicious “all-in-one” dish. 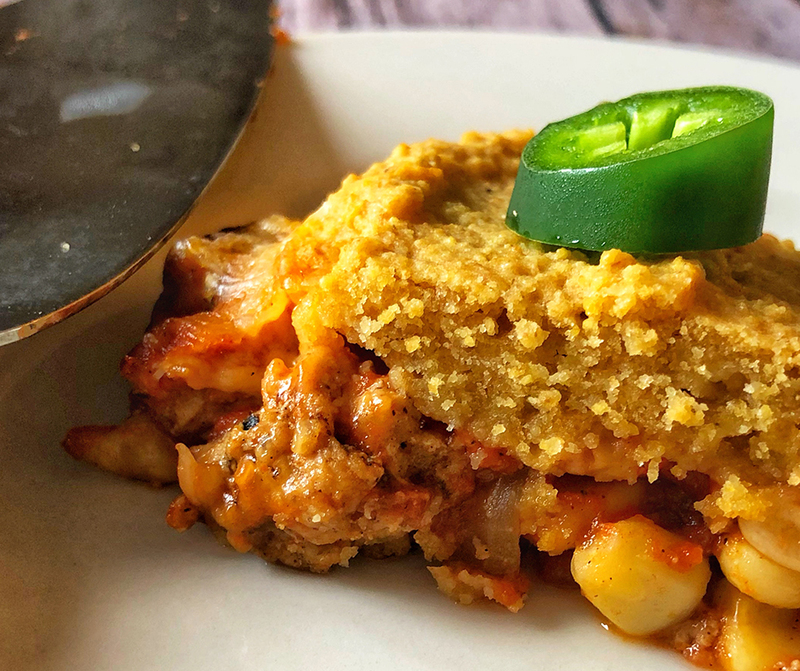 With a filling of mouth-watering chili, and a baked crust made from hearty Cornbread Crisps, flour, egg, milk and cheese; this dish will soon find a spot on your regular rotation. The perfect meal for a warm, weekend dinner with the family! Make your chili from scratch like we have or if you’re pressed for time, a chili packet or canned chili works just as well. Swap out pinto beans for black beans if those are your fave! AND if you liked this recipe as much as we do, we’d love to hear from you! Post pics of YOUR delicious dish on Instagram and either tag @farmerspantryusa or use #DeliciousDish. Heat olive oil in a large, ovenproof skillet over medium-high heat and sauté onion until softened and translucent, about 1 minute. Stir in garlic and cook for another 1-2 minutes, or until fragrant. Add the ground beef to garlic and onion mixture and cook until browned, 8-10 minutes. Drain off any excess fat then add chili powder, cumin, oregano, salt and pepper, tomato sauce, diced tomatoes, ½ cup corn and beans; stir until mixed. Reduce the heat to low and let the sauce simmer for 8-10 minutes. While the meat simmers, make the Cornbread Crisps mixture: mix together the flour, ground Cornbread Crisps, baking powder, 2 tablespoons of vegetable oil, milk, pinch of salt and egg. 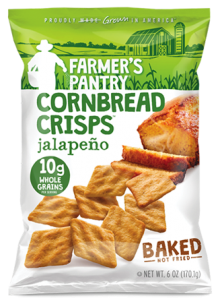 Stir ½ cup of the corn and cheese into the Cornbread Crisps batter and set aside. Pour Cornbread Crisps batter into skillet, on top of the chili and spread into an even layer. Add sliced jalapeños on top if desired. Place skillet in oven and bake until Cornbread Crisps topping is cooked through and chili mixture is bubbling, 20-25 minutes, or until golden. Serve hot. Enjoy! The spicy bite of farm-fresh Jalapeños and freshly-baked cornbread.